Our exterior improvements are going full force right now. The new roof is on, as is the new siding. After 17 years of absolutely hating our ugly 1970s aluminum siding (especially on our dormer window), we are thrilled with how natural the vinyl “cedar” shakes look. BEFORE: Despised & dented 1970s aluminum siding. 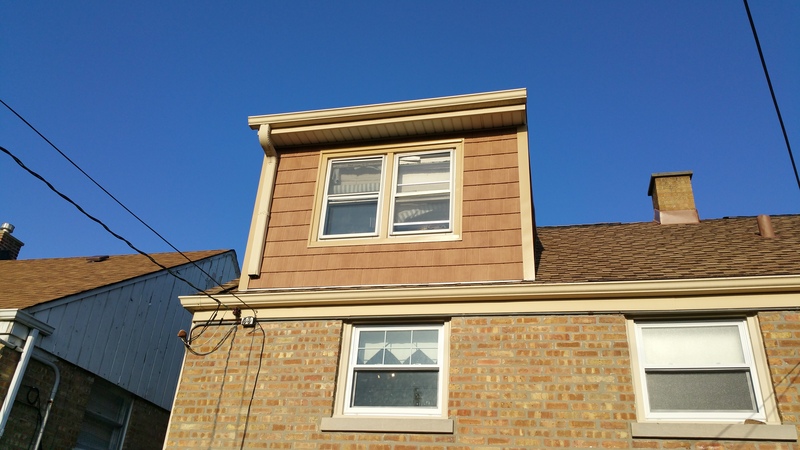 AFTER: Our new natural-looking “cedar” shake vinyl siding. The roof was another tear-off. We had a tear-off about 16 years ago, but from the look of the planking under our most recent roof, the previous roofers didn’t do a good job of replacing rot. 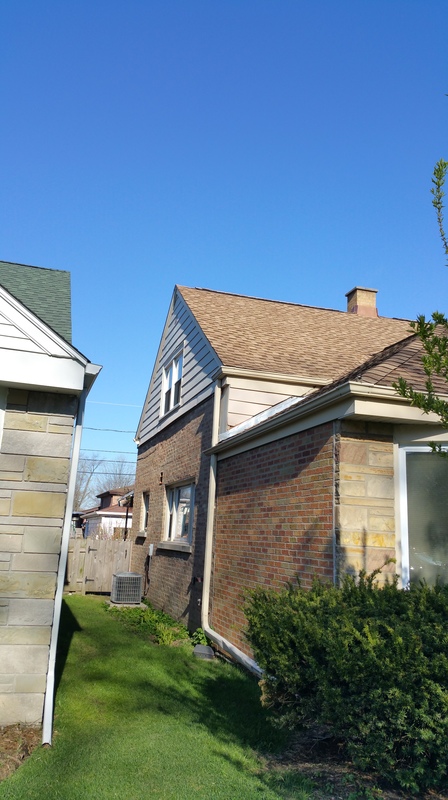 This time, we had several areas of rot replaced, especially on either side of the chimney. 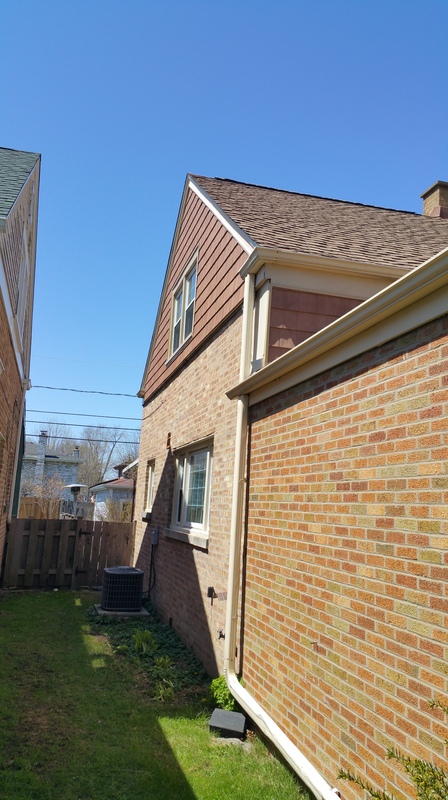 We also are now proud owners of a roof vent system that runs both along the peak and at the eaves to help air actively flow under the roofing. We are optimistic that it will help with the overpowering heat in our finished attic space in the summer. New siding completely changed the look of the back of our house! Two weeks ago, we finally outlined our patio project and container garden with twine. 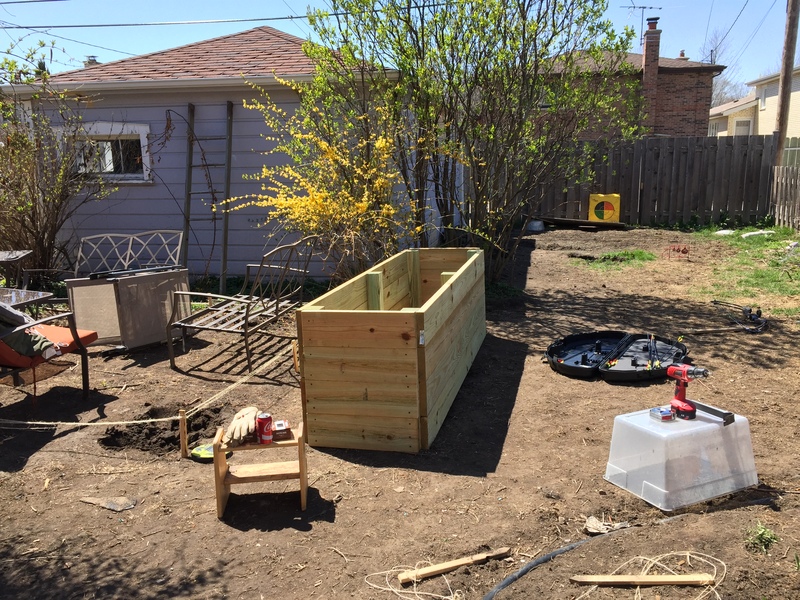 Last week, we kicked off our DIY spring/summer backyard project with the container garden. It almost sounds reversed. Shouldn’t we have started with the patio first? Well, the dirt from the patio excavation has to go somewhere. The container garden is 29″ tall and needs a load of dirt at the bottom, below the good garden mix. 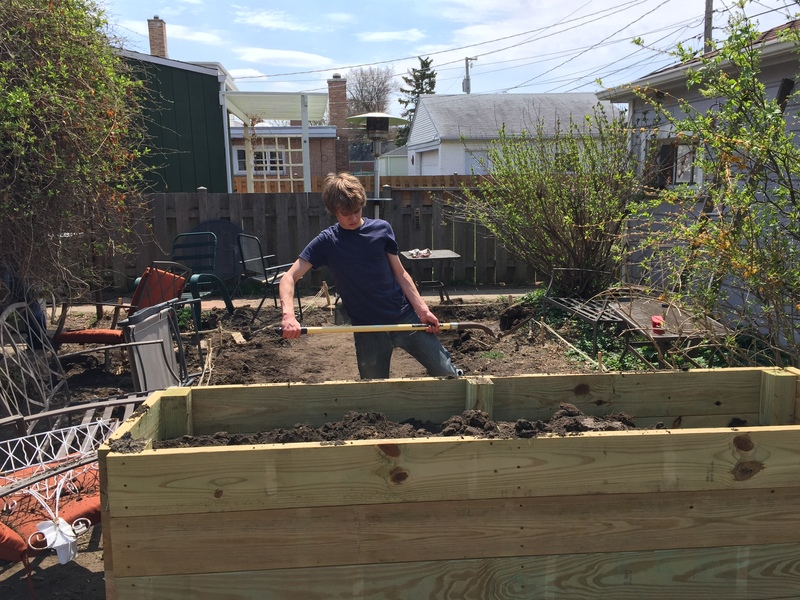 By building the container garden first, we are able to use it as a repository for all of that dirt. 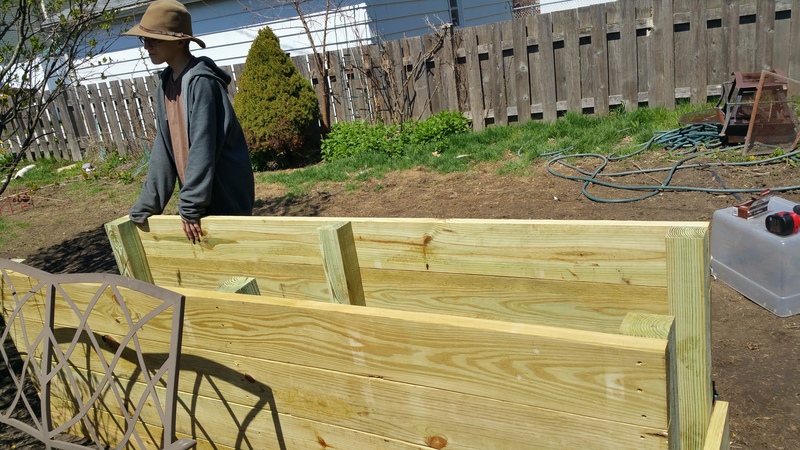 I really wanted to use cedar to match our fencing, but that more than doubled the cost of the wood. So, my spouse bought pine in the following sizes: (8) 8 ft.-long 2 x 8s (which are really 7-1/4″ pieces); (8) 2 ft.-long 2 x 8s; and, (6) wood posts cut at 29″. He also had to buy 3″ deck screws. Our total bill for the materials was about $150. We already own a battery-operated drill. We are both really happy that we bought the wood from a lumber yard (Crafty Beaver) where the employees can actually help with your project. According to my spouse, he was just one of several container-garden-building husbands who had come in that morning. In fact, the reason the posts were cut at 29″ is that the lumber yard employee knew that the 2 x 8s were not really 8″ but 7-1/4″ in real life. We had the posts and the 2-foot long 2 x 8’s cut at the yard. Using the handy corner brackets from the Gardener’s Catalog would have cost almost as much as the wood. So to handle the corners, my spouse bought 4″ x 4″ posts for each corner plus two posts for the middle of each long side to help prevent bowing. Again, all of the posts were cut to 29″. We used 3 deck screws per each end of a board to screw the pine planks into the posts. My husband and Teen #3 started with creating the long sides, then stood them up and screwed on the short sides. Peter is holding up one of the sides of the container garden. You can see how we used the posts for the corners as well as for support in the middle of the long planks. The patio will begin where the chair is. The other side will be turned into a pea-gravel Dog Path. The Container Garden: The north boundary of our patio. 2′ x 8′ x 29″ . Pine 2 x 8s. My spouse calls it The Sarcophagus–and it does indeed look coffin-like when empty. While spouse and Teen #3 were at work with the container garden, I dug out the rest of the fire pit, which our dogs so graciously started digging last year. See that little patch of grass to the right of the container garden? Yes, that little patch borders the 30″ diameter, 17″ deep fire pit. The dogs had dug 17″ down and about 24″ x 30″ by themselves. Today, I ordered the rim from Amazon.com. 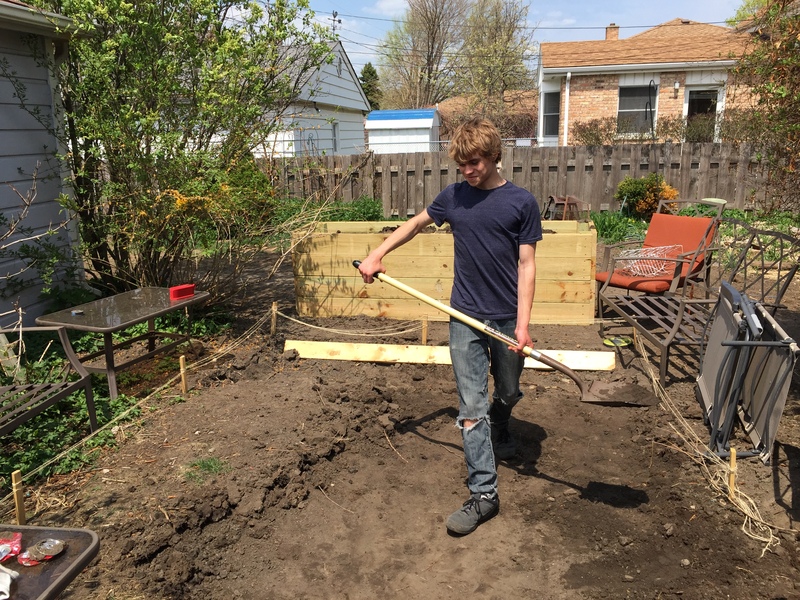 Today, Teen #2 finished digging out the 9′ x 12′ patio. Tomorrow, we order the brick, sand, and underlayment. Yeah!